Voices of the Forest, led by musical director Fabian Lochner, was set up in 2011 and meets weekly in Colbury, near Ashurst. With around 50 members from all over the New Forest, Southampton and Bournemouth areas we are a mainly unaccompanied choir singing in four-part harmony. Our repertoire takes in classical, jazz and opera but focuses mainly on world music, taking inspiration from the wealth of stories and musical styles from different cultures across the globe. This international flavour is perfectly represented in our first CD - World of Song. During 2014-15 we learnt a new repertoire of Mediterranean themed songs - from Spain and Portugal, Italy and eastern songs from Turkey and Israel. We recorded this repertoire on our CD - Sweet Sounds of the South. In early 2017 we recorded a new CD of Italian songs - this repertoire formed the focus of our concerts in 2016/7. Since early 2018 we have been learning a new repertoire of songs for performance. We enjoy performing in concerts around the New Forest, Southampton and Romsey areas and also sometimes host "Open Sings" - informal opportunities to join us and sing some amazing songs. Our forthcoming concerts and events are listed on this page and in the Performance section. In 2013 we signed a partnership agreement with Marie Curie Cancer Care, raising in excess of £1000 for the charity each year - the proceeds of concerts and events organised by us. Since 2016 we have been supporting Medecins Sans Frontieres, with a successful range of concerts and events. We welcome interest from prospective new members - click here to find out more. Like us on Facebook to keep informed of new concerts, news and events. 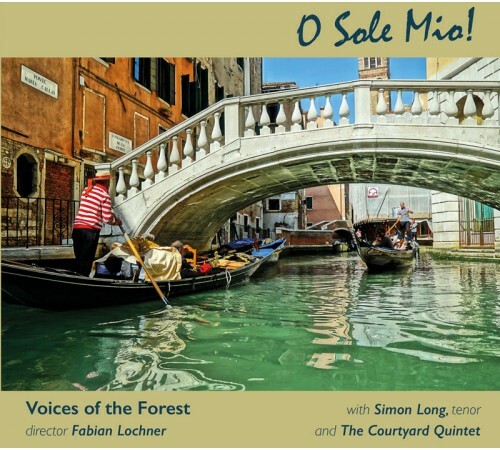 Voices of the Forest Choir's new CD - O Sole Mio! In May 2017 we released our third CD - the Italian themed "O Sole Mio!" The CD features 21 tracks. It features songs by Voices of the Forest choir, with guest appearances from tenor Simon Long - who sings on the title track and on some classics like Volari - and Southampton based wind quintet, the Courtyard Quintet. You can listen to some of the tracks below. The CD, along with our previous releases, is available for mail order purchase - click here to buy.